By Steve S. Ryan, PhD The most impressive technical achievement of the Symposium was seven live satellite ablation cases including one from Siberia. The satellite cases alone were worth the price of admission. In previous Symposia two or three satellite cases would be interspersed with pre-recorded videos. But this time they scheduled seven live cases back to back and for some events, even intercut between locations. Note: Throughout the Symposium doctors would often describe a particular device but not name it or the company which produced it. They probably wanted to avoid any conflict of interest or didn’t want to appear to favor one device or procedure over another. But I did research after the presentations and for the most part, I have identified and noted the name and manufacturer of particular devices that were demonstrated. The robotic camera and operating instruments were inserted through the various ports. With this system the patient did not have to go on bypass. His heart was still beating when the surgical lesions (RF burns) were made. He did have to have one side of his lungs deflated and re-inflated in order to fit the AtriCure bipolar RF clamp around the pulmonary veins. This same procedure was repeated on the other side of the chest after the live presentation. The images transmitted by the robotic camera were remarkably clear and vibrant. The clamp was inserted around each vein. 5-6 burns at a median output of 10 to 15 W were made on each vein to ensure transmurality. A roof line was also made. [I apologize for not being able to follow what additional lesions or burn patterns were made.] It was remarkable how big the patient’s Left Atrial Appendage was and how active and rapidly it pumped into the ventricle along with the left atrium. It was fascinating to watch the surgeons position the AtriClamp on the LAA and close it off. Dr. Pokushalov and his colleagues first did a normal PVI checking for Entrance and Exit Block and waiting 40 minutes to see if recurrence occurred before completing the PVI. They then mapped and developed a 3-D image of the artery and its branches leading to the kidneys just as EPs do when mapping and doing an ablation of the heart’s left and right atria. They made ablation burns within the artery branches leading to the kidneys (renal denervation) at 10 Watts for 6 seconds thereby reducing Sympathetic Tone (the functioning of the Sympathetic Nervous system). They made four burns in each artery branch, but they acknowledged that this field is so new they don’t know if this is the best technique. “What is a clear end point? How many burns are enough?” It’s not like doing a PVI catheter ablation where one can see the patient return to sinus rhythm. Attendees seemed shocked and disappointed at this news. Everyone, both doctors and patients, expected and hoped renal denervation would work. For some patients, who had tried everything else, it was their only hope to reduce their high blood pressure. There are many other methods being tested to denervate the renal arteries. But because of this news, one company has already announced it’s halting its trial. Until the data from Symplicity HTN-3 can be more thoroughly examined, renal denervation may be dead in the water. Editor’s comments: This ultimately may not be a bad thing. It points out the importance of well-performed trials to prevent the premature adaption of therapies [whether procedures or drugs] until they are thoroughly studied. It’s difficult when the expected benefits of renal denervation are so high, when patients know about it and request it, and when the procedure is recognized as safe. But in spite of its promise and the data coming from Europe, preliminary findings from the Symplicity HTN-3 study indicates that renal denervation doesn’t work. They then cut back to the Netherlands to show the catheter ablation part of the operation. The EP used a Lasso catheter inside the heart to confirm that the pulmonary veins were indeed isolated. The EP basically continued the lines inside the heart that the surgeon had created outside the heart. The EP also ablated the right atrium for Flutter which current surgical approaches can’t do. The EP also ablated the Coronary Sinus. 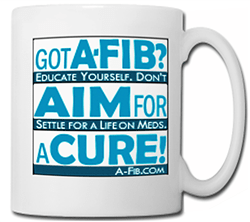 They mentioned that if someone has been in Persistent A-Fib for over three years, the success rate drops by 25%. If someone has had a previous heart operation, they generally can’t undergo this Hybrid Operation. Their goal is to return a patient to sinus rhythm during the operation. If they have to cardiovert someone to return them to sinus rhythm, the operation isn’t as successful. They talked about making a box set of lesions in the posterior left atrium to “debulk” that area, to stop A-Fib signals from propagating through the left atrium substrate which is often necessary in cases of persistent A-Fib. Dr. Mélèze Hocini of the Centre Hospitalier Universitaire De Bordeaux was introduced with her arms poking through arm holes in what looked like a Plexiglas type of shield, undoubtedly to protect her from radiation during the ablation. In the beginning Dr. Hocini couldn’t hear Dr. Ruskin and Dr. Mansour in Orlando. But that problem was soon resolved. (She was very poorly lit with low production values.) Dr. Hocini’s 61-year-old male patient had been in Persistent A-Fib for four months. Such cases are generally the hardest to cure. 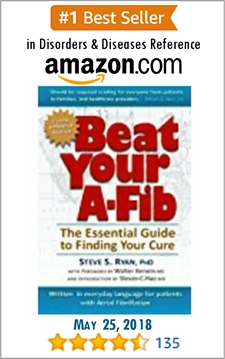 Someone in Persistent A-Fib has usually been in A-Fib for a long time and has often developed many A-Fib producing spots throughout the left and right atria. In this type of case, a simple Pulmonary Vein Isolation Ablation (PVI) usually won’t terminate A-Fib. The patient also had a huge left atrium (59mm) and a lot of fibrosis (22%). In the MRI fibrosis scale he would have been classified as a Utah 3. All the attendees recognized that this was a difficult case. 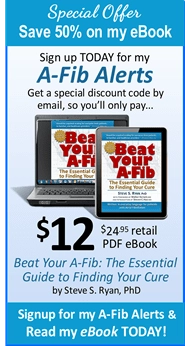 This was a truly ground-breaking presentation and historically an important milestone in the treatment of A-Fib. For the first time the world saw the ECGI (body surface) imaging and mapping system in action and in practical, day-to-day use. 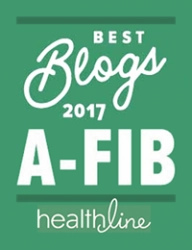 Instead of having to spend a great deal of time and effort [and radiation exposure] mapping and hunting down the multiple A-Fib-producing spots in the heart, this was all done beforehand for Dr. Hocini using ECGI. The day before his ablation, the patient simply laid down with a special vest on his chest like having an ECG exam with 256 electrodes rather than just twelve. These electrodes, imaged on the patient by a CT scan, produced an exact 3-D image of his heart and, what was most innovative, identified and labeled the location of all the spots producing A-Fib signals. This 3-D rendering of the left and right atrium with CT scan showed many different foci and rotors in the patient’s heart, but they seemed to cluster in three distinct areas. ECGI established a hierarchy of where to ablate. One starts where the most foci and rotors are. Fibrosis doesn’t guide the procedure or change this hierarchy at the present time. Rotors are generally found next to or bordering areas of fibrosis in preliminary data. We then saw Dr. Hocini ablating the areas that showed up on the ECGI. For an extensive discussion of ECGI, see my reports under the 2013 Boston A-Fib Symposium. From Milan, Italy. Drs. Claudio Tondo, Gaetano Fassini and Antonio Bartorelli of the Centro Cardiologico Monzino, University of Milan, Italy did a live insertion of a new Left Atrial Appendage (LAA) closure device available in Europe but not currently approved in the US. The patient receiving the device was a 72-year-old man in Chronic A-Fib who had a history of intestinal and cerebral bleeding. He also had a stroke risk score of four which meant he needed to be on anticoagulants and protected from having an A-Fib stroke. The Coherex WaveCrest occluder they installed looked like a piece of white foam with little barbs or hooks which attached the device to the LAA but were small enough that they wouldn’t puncture it. The device collapsed so that it fit on the end of a catheter which they maneuvered into the left atrium and into the LAA using fluoroscopy (X-ray) imaging and ICE (Intracardiac Echo). They had different sizes and shapes of these occluders to fit patients’ different LAA openings. Once inside the LAA they opened up the device, like opening up an umbrella, and attached the hooks. They weren’t happy with their first two tries and re-collapsed the device and repositioned it in the LAA a third time. To check that they had good contact and closure, they injected dye from the tip of the catheter to see if any would flow past the device into the left atrium. Then they simply withdrew the catheter, leaving the occluder in place in the LAA. This whole procedure seemed really simple to perform, though these doctors developed this facility only after years of study and experience. And it didn’t take long to do. (I know an EP in Los Angeles who installs the Watchman device in an average time of 20 minutes.) Anyone thinking of having a LAA occluder device installed could benefit from seeing this Left atrial appendage (LAA) Animation by Coherex. It’s reassuring to see how apparently easy it is to install. One of the most difficult tasks of a Cardiologist/Electrophysiologist (EP) is to determine, along with the patient, whether or not someone in A-Fib has a real need to be on anticoagulants. 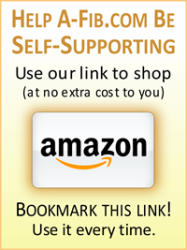 Blood thinners are not benign drugs. They’re not like taking vitamins. Current anticoagulants have their own set of risks and, in spite of the ads you see on TV, they are not to be taken lightly. This 72-year-old man had a high A-Fib stroke risk score and certainly needed protection from an A-Fib stroke which can be a fate worse than death. In A-fib the upper part of your heart (the left atrium) doesn’t pump out properly but instead fibrillates. Large clots can form usually in the Left Atrial Appendage (LAA) where 90%-95% of A-Fib clots come from. These clots are usually much larger than a “normal” clot. When they break loose and are transported to the rest of the body, they can completely close off a vein branch and cause a lot of damage. But when this 72-year old man took blood thinners, he suffered intestinal bleeding and cerebral hemorrhaging. This unfortunately happens all too often when one has to take anticoagulants especially as one gets older, and is part of the risk/reward ratio doctors and patients have to agonize over. Since he couldn’t tolerate blood thinners, this 72-year-old man decided to have his LAA closed off, where 90%-95% of A-Fib clots come from. It’s not an absolute guarantee he will never have an A-Fib stroke. There’s still that 5%-10% chance. But it’s probably his best option. If you can’t tolerate blood thinners or just don’t want to take them, you may want to check out LAA occlusion devices like the Watchman, Lariat II or AtriClip. Your doctor can discuss with you the strengths and weaknesses of each device. The Watchman is still in clinical trials in the US, but was recently approved by an FDA advisory panel. LAA occlusion devices do reduce blood flow in your heart which may be a concern if you are young and exercise regularly. But if you’re in your 70s or 80s and/or aren’t very active, this probably isn’t something to worry about. Dr. Hocini in France and Drs. Michele Haissaguerre and Pierre Jais in Orlando pointed out that many foci in persistent A-Fib patients are found in the left and right atrial appendages. This patient’s inferior left atrium, as is often the case, had the highest number of rotors. They discussed the fact that rotors do seem to drift somewhat. But they can be broken up or stopped from rotating by cross hatch ablations or other techniques such as using the newer circular wide area ablation catheters to encircle and block off the rotor areas. Thanks to ECGI this procedure used much less RF energy and needed much less RF burns than the old five-step protocol, which was good both for the patient and for the operating doctor. Later in the day Dr. Ruskin announced that this patient’s persistent A-Fib was eventually terminated and that he was in normal sinus rhythm. They then cut to Frankfurt, Germany. Drs. Boris Schmidt and KR Julian Chun of the Cardioangiologisches Centrum Bethanien performed a CryoBalloon ablation (“ICE T concept”) using the new, second-generation Arctic Front Advance Cardiac Cryo Ablation catheter (Medtronic) with eight cooling ports instead of four. The patient was a 61-year-old female in Paroxysmal A-Fib for two years. They used a temperature probe in the esophagus (as in RF ablation) The temperature in the esophagus should not go cooler than +12°C. Therefore they stop the freeze at +15°C. In contrast, if the CryoBalloon temperature goes beyond -60°C, they stop the freeze rather than complete the ablation. In Germany they have been using the CryoBalloon catheter for years before it was approved by the FDA for use in the US. Their results have been very good. The process of making the CryoBalloon ablations seemed amazingly fast. We then were transported to Royal Oaks, Michigan. Dr. David Haines of William Beaumont Hospital performed a thermal balloon ablation for paroxysmal A-Fib. The Toray Satake Hot Balloon Catheter is named after its inventor Dr. Shutaro Satake of the Hayama Heart Center in Japan who was with Dr. Haines. The balloon is filled with a solution of saline. When radio frequency energy is applied through a coil electrode in the balloon, this heats the saline. Dr. Haines maneuvered the balloon into a pulmonary vein opening. When he pressed the balloon into the PV opening, the compliant material of the balloon seemed to mold itself to the shape of the opening. He would apply heat to the PV opening for around 2½ minutes and heat it to 70 degrees Celsius. He used an esophageal probe to measure heat and a special cooling system in the esophagus. He also paced the phrenic nerve to make sure it wasn’t damaged by the heat. Dr. Satake has performed over 500 ablations in Japan using this Hot Balloon catheter. One would expect applying this much heat to an extensive area of the PV openings would carry an increased risk of stenosis, a swelling of the pulmonary vein opening restricting blood flow. But Dr. Haines says this has not been the case. (For a detailed description of the thermal balloon catheter, see the subheading “Radiofrequency ‘Hot’ Balloon” in the article, “Balloon Catheters for Ablation“.) In an interesting juxtaposition during Dr. Haines’ presentation, the satellite program cut back to the Frankfurt group who were doing CryoBalloon ablations. They had completely isolated all four pulmonary veins in 60 minutes. That’s a very short time to do a catheter ablation PVI. They then cut back to Dr. Haines who finished his ablations with the Hot Balloon catheter. NOTE: Dr. Haines and three other centers are recruiting patients for preliminary clinical trials of the Hot Balloon Catheter. The other centers are Mount Sinai in New York (Dr. Vivek Reddy), Texas Cardiac Arrhythmia Institute in Austin (Dr. Andrea Natale), and the Medical University of South Carolina in Charleston (Dr. J Marcus Wharton). Editor’s comments: As a patient you may be asking which of these different catheter balloon strategies would be the best for me. It’s far too early to tell with the Thermal Balloon until it gets further along in clinical trials. But from what I’ve seen, I’m willing to speculate. Because the thermal Balloon is more compliant and flexible than the CryoBalloon, when it’s pushed up into a pulmonary vein, it probably burns higher up into the vein than the CryoBalloon. This combined with the RF heat would seem to be more apt to produce stenosis than the CryoBalloon. And stenosis is something patients need to avoid if at all possible. Unlike most other catheter ablation complications which are temporary and fixable, stenosis is permanent and usually irreversible. If you develop stenosis, your life is wrecked. CryoBalloon catheters are more rigid than the Thermal Balloon and, when sized properly, usually only freeze on the outside edges of a pulmonary vein. Because pulmonary vein openings aren’t perfectly round, it may take two or three CryoBalloon placements and freezes to completely isolate around a vein. But this is relatively easy to do. Freezing creates a different kind of ablation than thermal RF. One advantage of Cryo is that, if the Balloon is improperly positioned, the preliminary freezing can be stopped and the area allowed to defrost and return to normal. This isn’t possible with thermal RF. A freezing ablation looks different than a thermal RF ablation. There is no burn scarring. Frozen ablated heart tissue looks very similar and seems to have an integrity similar to that of normal heart tissue. When the CryoBalloon is positioned against a vein opening, the preliminary freezing action sticks the balloon to the opening (like a kid sticking his tongue to a frozen lamp post). It’s harder for flowing blood to push the CryoBalloon away from the vein opening or create gaps. 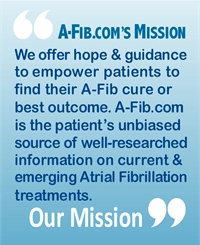 Someone asked me why most of the world leaders in A-Fib ablation haven’t moved to CryoBalloon ablation, since it seems to be easier, faster and safer for patients than regular RF ablation. Most likely because they are so experienced and skillful with RF point-by-point ablation and get such good results, that for them RF ablation is as easy and fast as CryoBalloon ablation. And they generally work in the antrum and don’t get near the pulmonary vein openings. But this is definitely a question I need to ask these A-Fib leaders. Right now I don’t have the answer. It produced 3-D color images of the left and right atrium. You could see in real time the catheter electrode making burns. The doctors explained how this system used only 2-3 minutes of fluoroscopy compared to a normal ablation which could produce 38 minutes of radiation exposure. This was most welcome news for the attendees doing catheter ablations. Editor’s comment: Radiation Reduction is a concern not just for patients, but especially for doctors, nurses and staff in the cath lab during ablations. I was recently in a cath lab and observed several ablation procedures. I and everyone there had to wear a leaded waist belt, vest and thyroid protector. The doctor doing the procedure wore special anti-radiation glasses to protect him from retinal radiation damage. These leaded protectors are not light. The floor is padded to make it easier for the EP to stand with all this weight. Doctors may do 3-4 ablations a day and are exposed to a lot of fluoroscopic radiation. Doctors and others in the cath lab worry about being exposed to so much radiation and its long-term effects. Anything that will lower exposure to radiation in the cath lab is important both to patients and particularly to doctors. These live satelite events were extremely informative and educational. And as a five-and-a-half hour event, quite an accomplishment. Having worked in broadcast television and on several Live TV events (i.e. ; the live EMMY Awards Presentation show, broadcasting of the 1984 Los Angeles Olympics and numerous sporting events for NBC), I know this was an incredibly complex event. The staging teams had to coordinate and intercut between multiple satellite and trans-oceanic optical fiber video feeds. But before that, the planning teams had to schedule and coordinate multiple locations, with multiple cameras, audio and lighting personnel and equipment in order to video the numerous doctors working in their respective operating rooms and EP labs. (Not to mention dealing with the multiple languages spoken by the doctors and their staff).